Bring the milk to boil in a pan and simmer it till it gets reduced to half. Add sugar and cook for some more time till it gets thickened. Now add cardamom powder and put off the flame. Allow it to cool. Garnish with chopped dry fruits. 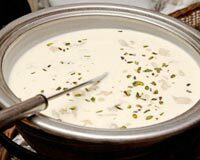 Basundi is ready. Serve chilled.